This month marks the 10th anniversary of the decision by the Bush-Cheney administration to invade the country of Iraq and initiate what can be called a war of choice. This is a good time to briefly look back at this unsavory historical episode. Public opinion polls indicate that a majority of Americans now think the 2003 Iraq war, in which tens of thousands of Iraqis and thousands of Americans died, was a mistake. In the UK., the other country most involved with the Iraq war, a similar poll taken recently indicates that only 28 percent of Brits now believe the war was justified and made the world a safer place. Other polls also indicate that George W.Bush has a good chance to be considered, if not the worst, certainly among the worst presidents the United States ever had. The man had no moral compass. Indeed, his personal and unilateral decision to launch an illegal war of aggression in 2003—against Iraq, a country that had not attacked the United States—based on disingenuous lies, fabrications, disinformation and propaganda, and in violation of the United Nations’ Charter, whose Security Council refused to authorize the American aggression, will go down in history as one of those abuses and pretexts that devious politicians resort to when they want to circumvent international law in order to promote some narrow personal or national interests. But Iraq had a lot of oil, and it was considered in certain circles an enemy of Israel, a country that the current generation of American politicians supports blindly. That was enough to want to topple its government and take control of it. In the summer and fall of 2002, distressed by what I considered nothing less than a neocon cabal and a series of outrageous lies by the Bush-Cheney administration, I began writing a book denouncing the coming war of aggression against Iraq. The book was initially published in French six weeks before the March 20, 2003 military assault against Iraq under the title “Why Bush Wants War” (“Pourquoi Bush veut la guerre”), a book presently out of print (now a collector’s item). It was published one year later, this time in English, under the title of “The New American Empire”, and, a few years later, was published in Europe under the title of “Le nouvel empire américain” and it was also translated into Turkish under the title “Yeni Amerikan ImperatorLugu”. The book described the type of cabal and aggressive war campaign in the Bush-Cheney administration and in many American media to push the United States toward an illegal war of aggression in the Middle East in order to overthrow Iraq’s Saddam Hussein regime and to exert an overt influence in the way that country uses its natural resources. Indeed, the 2003 American war against Iraq was primarily an economic war, because the government of Saddam Hussein was excluding U.S. and U.K. companies from Iraqi oil resource development. This was in retaliation for these two countries supporting unconditionally Israel’s decades-long oppression of the Palestinians. As a consequence, the Bush-Cheney administration and its vassal Tony Blair in England felt that they had to intervene militarily in order to prevent French, German, Russian, and Chinese oil companies to develop Iraq’s oil, while U.S. and U.K. oil company interests were excluded. Basic economic interests were thus at play and international law was powerless to stop the military onslaught. The pretext found was to accuse Iraq to harbor “weapons of mass destruction” that it could possibly and eventually use against its neighbors. Such so-called “weapons of mass destruction” were never found because they never existed in the first place, as the Hans Blix U.N. inspecting commission had publicly certified. The entire propaganda operation by the Bush-Cheney administration was nothing more than a lie and a fraud. Mind you, the 2003 Iraq war was triggered by the Bush-Cheney administration after the United States was already involved in a protracted war against Al Qaeda fundamentalist conservatism in Afghanistan, and this since the fall of 2001 under a United Nations’ authorization and in retaliation for this latter country Taliban government’s support for the 9/11 terrorists. Another oft-repeated lie by the Bush-Cheney administration was that the government of Iraq had been involved, one way or another, in the 9/11 attack. Not a thread of evidence has ever been produced to that effect, while all indications were to the contrary that secular Saddam Hussein was vehemently opposed to the religiously-bent Al Qaeda terrorist network of Osama bin Laden. The American people and a majority in Congress would probably not have supported the Iraq military invasion had there not have been a barrage of propaganda that originated from the pro-Israel Lobby in the media and the Cheney-Rumsfeld-Wolfowitz-Libby-Perle cabal inside the U.S. government. These two campaigns had a tremendous impact in persuading a passive public still shaken by the 9/11 terrorist attacks that the lies it was fed were facts. We pretend to live in countries of laws and not of men and that nobody is above the law. This can be disputed, however, in light of the fact that no one in the Bush-Cheney regime in the U.S. and in the Tony Blair regime in the U.K. has been held accountable to date for this massive abuse of power, a prima facie impeachable offense. Instead, most of the actors in this tragedy have been rewarded with plush nominations. 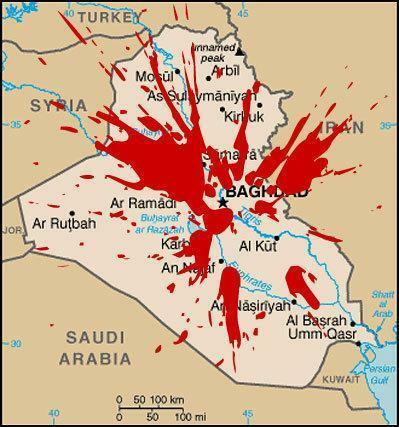 The U.S. military officially withdrew from Iraq in 2011, but that country is still in a mess and it will suffer economically and politically for decades to come the destruction and destabilization it has been subjected to by the 2003 U.S.-led military invasion.